Seriously this has got to be one of the most sinful foods on a Chinese menu. But then again it has got to be one of the most delicious as well ... of course if you are into eating fats! 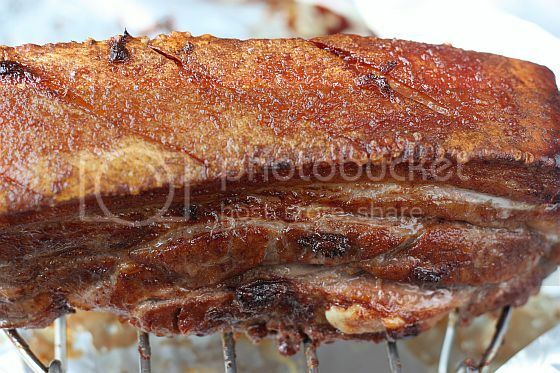 Just think of the taste of crispy pork crackling with layers of fat and moist, tender meat has gotten me going already. I know some of you will probably say urrghh ... look at the amount of fat and cholesterol, and simply shudder by just looking at it. I say indulge in some sinfulness once in a while is okay. 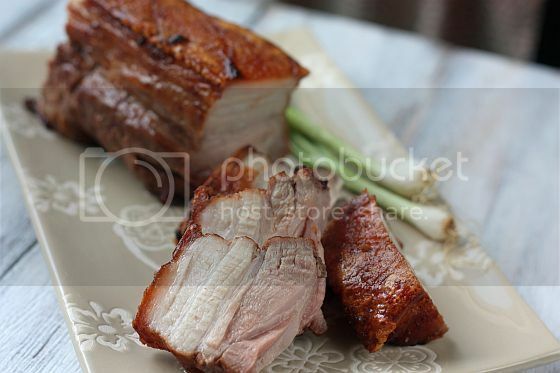 In my childhood days, my mum would buy Siew Yoke (Chinese Roast Pork Belly) together with Char Siew (Chinese Roast Pork) when she did her weekly marketing. She would slice up both meats and we would have this included in our Sunday repetiore of dishes. Any left over meats would be used to fry rice or added into stir fried vegetable dishes. Those were the days when my family were into so-called "unhealthy" eating habits. These days my parents ever hardly buy Siew Yoke or Char Siew. Definitely not Siew Yoke that's for sure because they have stayed off eating fatty foods. I guess as we grow older, our bodies are unable to adapt so quickly to rich and fatty foods. We would have to make a choice between eating healthy and staying healthy. I have always been intrigued as to how Siew Yoke was made and after seeing so many photos of it in other foodie blogs I decided to try it out one weekend. I was amazed as to how easy it really is and my first attempt turned out quite nicely. However I must confuse that I did not marinade my pork belly overnight. In my eagerness to make it, I just did a four hour marinade. When I posted up a picture of the cooked Siew Yoke up in my Facebook one of my girlfriends asked me who else had a share in enjoying it. My answer was "me, me and me"! 1) In a bowl add on the ingredients with the exception of the rock salt and vinegar. Mix the ingredients until it becomes a paste. 2) Clean the pork belly and pat very dry with paper towels. 3) Score the flesh part (not the skin) of the pork belly lightly in diagonal lines and rub the joint with the paste marinade. Place the joint in a foil-lined roasting tin, marinated side down so it can sit and absorb the flavours. 4) Score the skin part this time, using a sharp knife and being as thorough as possible. Rub in the rock salt all over the skin making sure you get into the cuts. 5) Place the pork belly in the refrigerator uncovered to dry completely. 6) The next day remove the meat from the refrigerator. 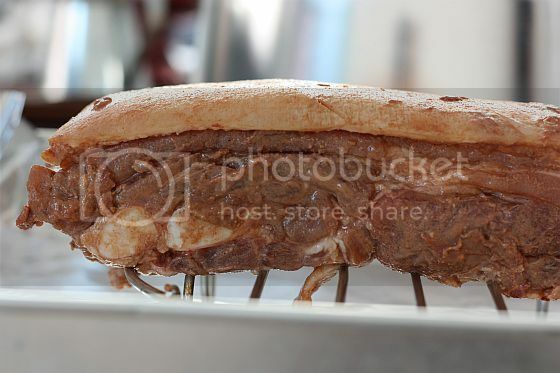 Line a baking dish with foil (to catch the drippings) and place the meat (skin facing up) on top of wire rack. Bake the meat in a 200C pre-heated oven for 30 mins. 7) After 30 minus, remove the tray and poke the skin using a fork. Then drizzle the vinegar over the skin. 8) Return the tray to the oven and change the settings 250C on grill function (upper heat only). You will see the crackling start to bubble and pop wherever you poked with a fork. Grill for a further 30 mins, opening the oven door intermittently to let smoke escape, until the skin gets slightly burnt and charred. (Any blackened bits can be removed after cooking). 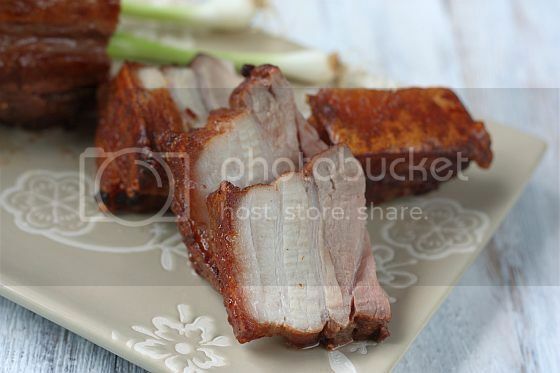 9) Rest the cooked pork belly for 15 minues before slicing. ooohhhh mmmmyyyyy..... this just looks too delicious! Yum...me and my family love this.. can't wait to make "Siew Yoke" again! Just can't stop drooling at your roast pork picture! Simply delicious! Yes, I am into eating fats....hee heee. I want some!